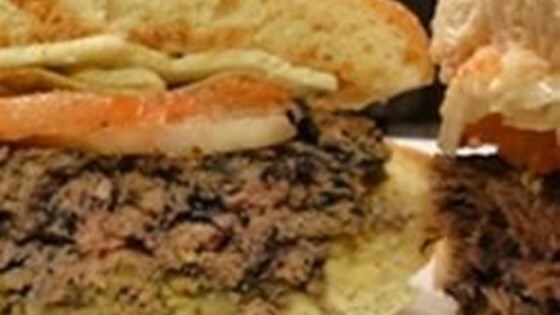 "Very lean ground beef, blueberries and flax come together to make a delicious, juicy, and healthy burger." Place blueberries in a food processor; pulse until finely chopped but not pureed. Mix blueberries, ground beef, flax meal, salt, and pepper together in a bowl; form into 12 burger patties. Freeze until patties are firm, about 10 minutes. Cook burgers on preheated grill until no longer pink in the center and the juices run clear, 3 to 5 minutes per side. An instant-read thermometer inserted into the center should read at least 165 degrees F (74 degrees C). I use 90 or 95 percent lean ground beef for this recipe. Kosher salt can be used in place of sea salt, if desired. Grill patties depending on how you like your burgers cooked. The meat is lean and will cook quickly with no flare ups.